Researchers at The University of Texas at Austin’s Institute for Geophysics (UTIG) in the Jackson School of Geosciences have discovered two seafloor gateways that could allow warm ocean water to reach the base of Totten Glacier, East Antarctica’s largest and most rapidly thinning glacier. 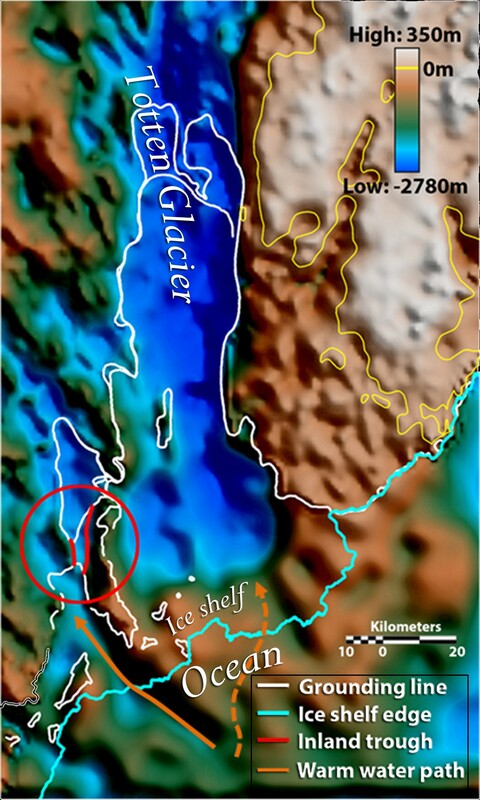 The discovery, reported in the March 16 edition of the journal Nature Geoscience, probably explains the glacier’s extreme thinning and raises concerns about how it will affect sea level rise. “The catchment of Totten Glacier is covered by nearly 2½ miles of ice, filling a sub-ice basin reaching depths of at least one mile below sea level,” said UTIG researcher Donald Blankenship. Greenbaum and Blankenship collaborated with an international team from the United States, Australia, the United Kingdom and France. Because much of the California-sized interior basin lies below sea level, its overlying thicker ice is susceptible to rapid loss if warm ocean currents sufficiently thin coastal ice. 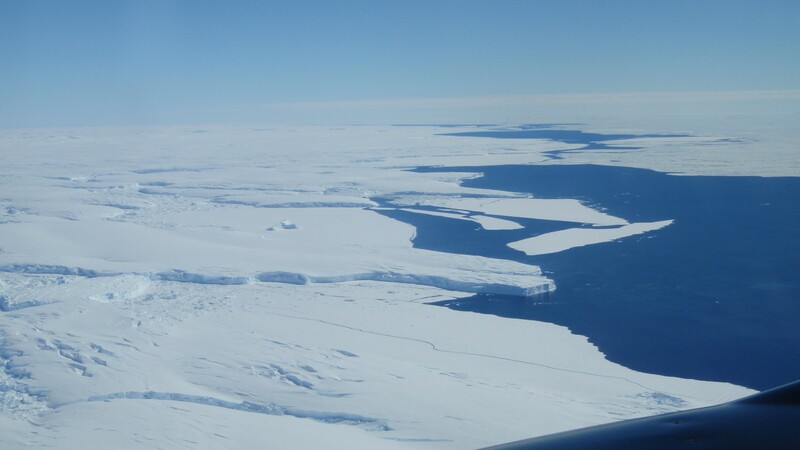 Given that previous work has shown that the basin has drained its ice to the ocean and filled again many times in the past, this study uncovers a means for how that process may be starting again. 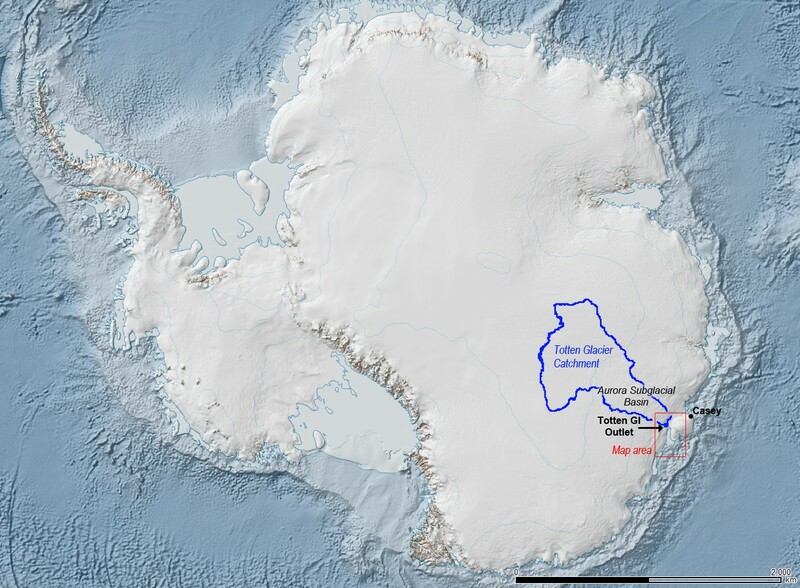 The Totten Glacier catchment (outlined in blue) is a collection basin for ice and snow that flows through the glacier. It’s estimated to contain enough material to raise sea levels by at least 11 feet. Image: Australian Antarctic Division. “We’ve basically shown that the submarine basins of East Antarctica have similar configurations and coastal vulnerabilities to the submarine basins of West Antarctica that we’re so worried about, and that warm ocean water, which is having a huge impact in West Antarctica, is affecting East Antarctica, as well,” Blankenship said. The deeper of the two gateways identified in the study is a three-mile-wide seafloor valley extending from the ocean to beneath Totten Glacier in an area not previously known to be floating. Identifying the valley was unexpected because satellite analyses conducted by other teams had indicated the ice above it was resting on solid ground. Special analysis of ice-penetrating radar data shows the bottom of the ice over the valley is smoother and brighter than elsewhere in the area — tell-tale signs that the ice is floating and being eroded by the ocean. is also the possibility for retreat into an interior basin. As in the West Antarctic Ice Sheet, complete collapse of the Totten Glacier catchment may take many centuries, although the timing of retreat in both places is the subject of intensive research. The UTIG team collected the data during five Antarctic field campaigns using aircraft loaded with equipment to analyze the ice and seafloor in regions that even icebreakers are unable to reach. The airplane was outfitted with radar that can measure ice several miles thick, lasers to measure the shape and elevation of the ice surface, and equipment that senses the Earth’s gravity and magnetic field strengths, which are used to infer seafloor shape. The data for this study were gathered as part of the UTIG-led ICECAP (International Collaboration for Exploration of the Cryosphere through Aerogeophysical Profiling) project with support from the U.K.’s Natural Environment Research Council, the U.S. National Science Foundation, the Australian Antarctic Division, as well as NASA’s Operation IceBridge, the G. Unger Vetlesen Foundation, and the University of Texas at Austin’s Jackson School of Geosciences. 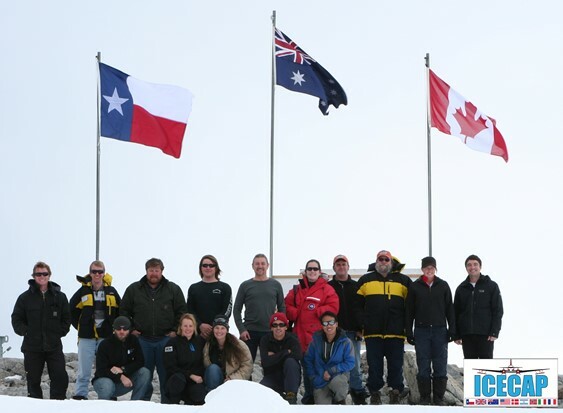 The ICECAP aircraft was operated under contract to the University of Texas Institute for Geophysics by Kenn Borek Air LTD., Calgary, Alberta, Canada.